Things I've been making, fixing, modding, breaking. I love my all-black monochrome Chuck Taylors, but they don't exactly lend themselves to night-time bike safety as-is. But with these Brompton X Vespertine Reflective Shoelaces, Tenacious Tape Reflective Tape, and Albedo 100 Reflective Spray, these shoes transform into super-high visibility shoes when hit with a flash of light. I commute by bike, and during the winter this means I spend a lot of time commuting in the dark. I have been trying out different ways to increase my visibility: various bike lights, wearable magnetic lights, reflective tape, reflective fabric -- but none of these options worked well with my favorite wool coat. Tapes don't adhere well to wool, and hi-tech looking lights take away from the natural aesthetic feel of the wool coat. I gave the Albedo 100 Reflective Spray a try to see if this would be a good option. The paint is temporary - so relatively low risk - and supposedly invisible during the day. I found that the paint was incredibly reflective, but not truley invisible by day. It kind of looks like I have a light dusting of fake snow where the paint is strongest. It's not ideal, but I'm not really sure you would notice if you weren't looking for it, and honestly I would say that the added visibility and safety is worth the trade off of having the slight discoloration by day. My husband and I commute by bike, and this means going in and out of our gate throughout the day from both directions. Anyone who brings their bike inside regularly will be familiar with the physical maneuver that is hoisting the door open while you slide through with your bike. Usually this is okay in one direction, but a pain when you have to pull the door open towards you first before going through. The time finally came this summer where the decorative inner section of our old gate broke and it was time to replace it. This time we opted for a gate that would swing both directions, like saloon doors. Ideally we could just push through the gate with our bikes in either direction, without any awkward gymnastics. Once we replaced the gate however, we found that the spring mechanism wasn't really strong enough to close it quickly or keep it closed. This meant that our tiny dog or even a small gust of wind could push it open. And if we were to keep the latch in the locked position, then it would be hard to get through if you were on the wrong side of the gate. We wondered: how could we latch the gate in way that was easy for an adult to push open from either side, but provided a strong enough force against wind and dogs? The folks that installed the new gate threw out a harebrained idea to use some kind of magnet since the new frame on the gate was steel. I tested with a few hard-drive magnets on-hand and although the force was weak, it was promising! After a little testing, we came up with this magnetic gate latch concoction: We got an aluminum carpet threshold as the base, this gave me a surface to mount the magnets to that wouldn't interact with the magnetic field. We got a lot of 24 identical Neodymium rare earth hard drive magnets and gorilla glued them to the threshold. We then wrapped skid-proof pads to the threshold to add friction and help slow down the gate as it passes by. 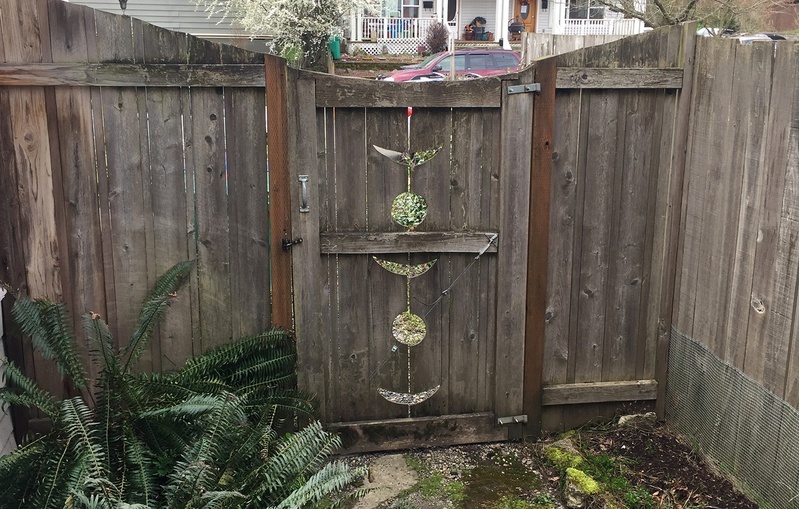 If you're looking to make a gate that swings easily in both directions, I definitely recommend the magnetic solution as an option. P.S. If you do use these hard drive magnets, watch your fingers as these magnets have a death grip pinch that will draw blood. P.P.S If you happen to follow this design, one thing I found very helpful in slowing down the gate was to allow a little bit of "slack" in the aluminum threshold so that it could bow out slightly to meet the steel frame on the gate itself. This slowed down the gate much faster than when the aluminum threshold was completely flat against the post. I recently canabalized this sweater to line the hood of my new raincoat, and while doing so I noticed that the diameter of sleeves was strikingly close to the diameter of Lola's torso. One cut and two arm-holes later, Lola has a new sweater. In my ongoing quest to avoid rain pants, I gave waxing a try. I used three layers of Otter Wax, ironing them in-between each layer. 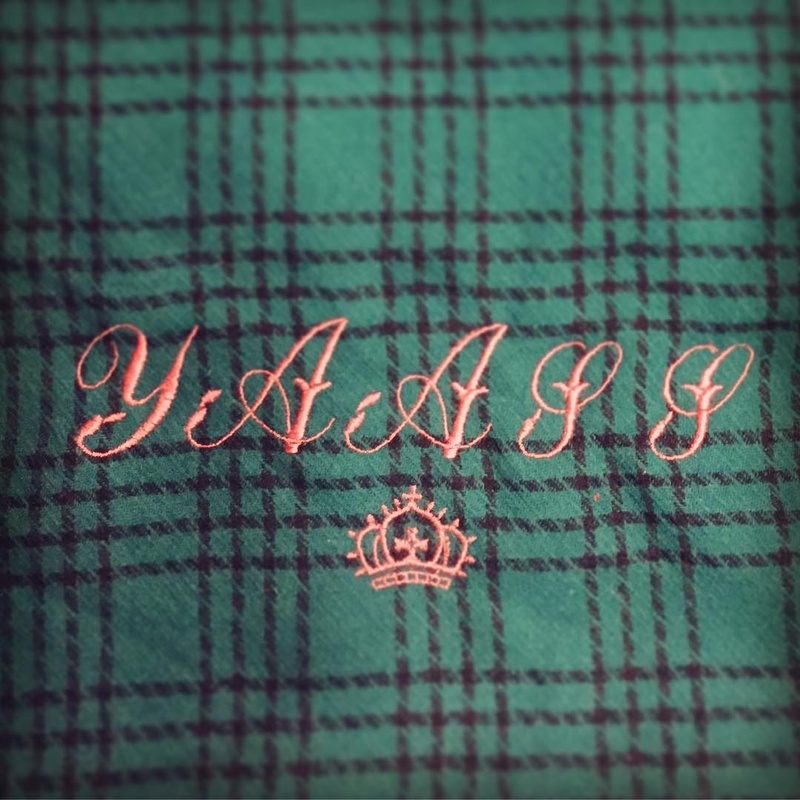 When the wax is first applied it looks light and cakey, but once ironed it disappeared into the fabric. I find that with the wax my jeans have a heavier, more structured feel and are fairly resistent to a light dusting of water. In a heavy rain I found that they absorbed some water, but dried out pretty quickly (within an hour) once I got to work. Normally my jeans would have been soaked for most of the day. Given that most "rainy" days in the Pacific Northwest are pretty light, I would say this is a good alternative to rain paints. Change your buttons, change your life. Basketball season is upon us! 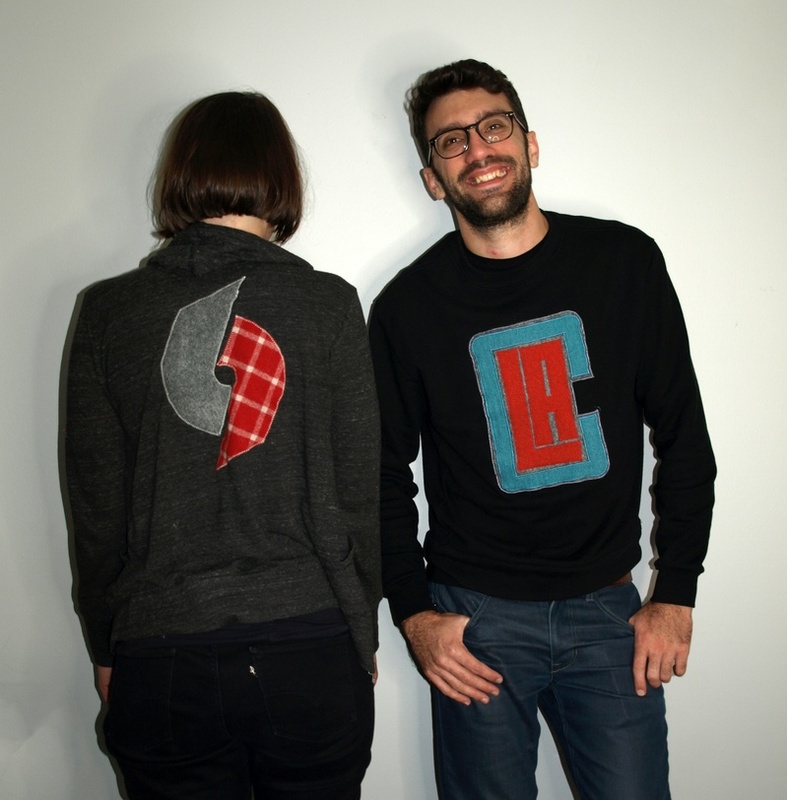 To show our spirit, Mike and I made this home made LA Clippers sweater for Johannes and Portland Blazers hoodie from old skirts we found at the Goodwill. For when you really want to be seen day and at night. Since I started biking to work I've been very pre-occupied with safety, and in particular visibility at night. I found this amazing jacket at the Goodwill and filled the lining with a battery-powered LED strand and a reflective strip. I've had this pair of blue Ecco shoes now for a few years, but was never crazy about the tepid blue color. 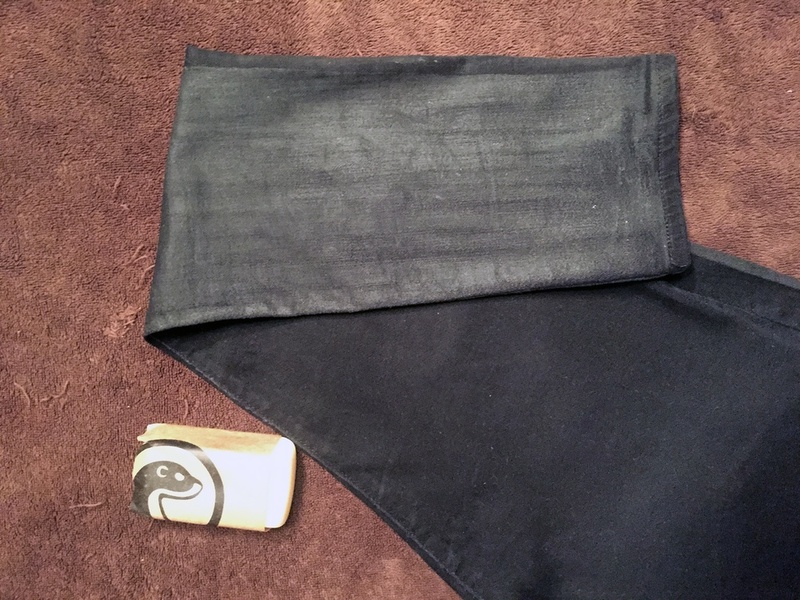 I gave Fiebring's leather dye another try - this time in black. I found that after one layer of dye the shoes were left a very dark navy. After a second round of dying the leather they reached a true black. Yas Queen it's that time of the year agin! Nina Pavlich is a software architect, full-stack web developer, and trigonomateur.